If you haven’t heard about the 2017 Total Solar Eclipse making its way across the country on August 21st, congratulations! It’s the only thing all of us Central Oregonians seem to be talking about these days, as the date draws ever nearer. 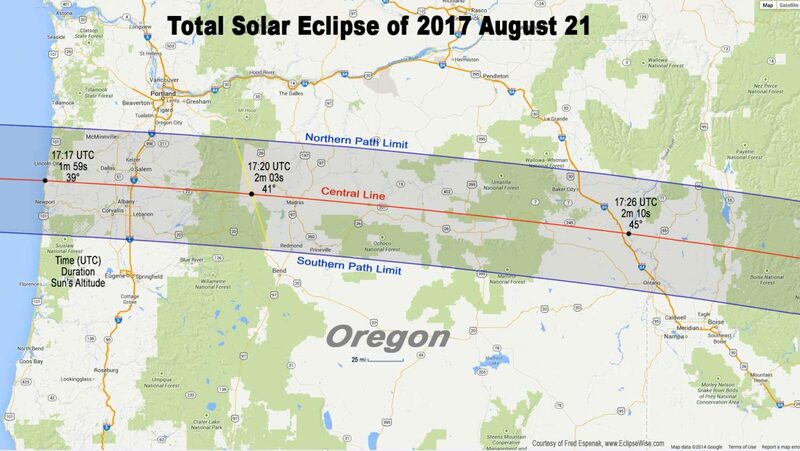 And Prineville will have prime viewing of this rare astronomical event, as its location is within the path of totality. This means while other Oregon towns will be able to witness a partial eclipse, those of us in Prineville will experience a true total eclipse. With that, brings an influx of people to our region. Great for our economy? Probably. Hassle for those of us wanting to go about our regular business? Definitely. But how lucky are we to live here and have the opportunity to experience this without traveling from far off places to see it. And even though the eclipse will last just a few minutes, we’ll probably be talking about it for years to come. So stay safe (wear your eclipse glasses!) and make friends with someone who has ventured into our neck of the woods for this fun event. You may just find yourself enjoying Eclipse Day after all! This entry was posted in Central Oregon. Bookmark the permalink.